This extract by Averil Staunton is from the original unabridged article on Ballinrobe's history by Dr Patrick F. Wallace, who has been the Director of the National Museum of Ireland since 1988, and written by him c. 1972 for Ballinrobe's Bridge Magazine. As the article is fourteen pages long we will put it up the entire article over 5 seperate parts. Dr. Wallace was a teacher in Ballinrobe before his later appointment as the archaeologist in charge of the National Museum of Ireland's excavations at Wood Quay – Fishamble Street - in Dublin. These were the largest Viking age urban excavations ever undertaken in western or northern Europe. Later again as Director of the National Museum of Ireland he has been responsible for the modernisation of the management, operation, exhibitions and services of the Museum. The National Museum of Ireland now has four sites; staff numbers have almost trebled, and a series of new departments enable it to discharge its duties and play a significant role in the cultural life of the country. Having witnessed the expansion of the Museum to Collins Barracks, Dublin and the creation of the Folklife Museum at Castlebar, Co. Mayo, Dr Wallace has overseen the modernisation of the Institution by introducing new departments of conservation, registration, education and marketing. The object of the current exercise is to show the people of Ballinrobe and its surrounding countryside something of the ordinary day-to-day life of the town in the half century which separated the 1798 Rising from the Great Famine of one hundred and twenty-five years ago. Such a sketch is limited in a myriad of ways, especially in that any proper treatment of the subject would have entailed far more research-time than that at the disposal of the writer, and can only serve to stimulate the reader to search further for himself, if he be fortunate enough to have leisure on his hands, and in some future issue of the Bridge, may be prompted to present a further and less selective treatment of the topic than that which shall presently be laid before you. If, for a moment, I provide you with a glimpse of the town and countryside as it was in your great-grandfathers' time, I will have achieved my task. Travellers' accounts are often enlightening and always entertaining. With the advent of the Romantic Era in English literature, inspired by the pioneering verse of Wordsworth and Coleridge came the rejection of the strictures of the Industrial Revolution, the idolisation of nature and of free man, and the partiality for medieval times with their gloomy castles and romantic abbeys; the latter trait being more peculiarly a characteristic of Keats and Shelley, the two Romantics par-excellence of the succeeding decades. Ireland offered the Romantic scope to explore these avenues in abundance. Shelley, Scott and Wordsworth among others, paid Ireland visits in search of the picturesque and the romantic in the decades of which I speak. But Ireland had more to offer the English traveller at this time. For many, it was the alternative to Europe when the continent was closed to the traveller during the era of the French Revolution and the succeeding- Napoleonic Wars. Here, at least, a tour could be undertaken with a comparative degree of confidence, for Ireland, poor though its people were at this time, had a remarkable lack of highway-robberies, and many travellers among them W.M. Thackeray and H.D. Inglis, who praised grudgingly, complimented Ireland on the absence of any threat to their personal security, while they toured around on jaunting cars, stage or mail coaches or by any means whatever. Further encouragement to the potential traveller in Ireland was provided by the presence of good roads nearly everywhere, including the southern part of County Mayo according to one 1802 authority, for in the judgement of no less a writer than Arthur Young, writing at the time of the American War of Independence, they were superior to those of England. The dynamic Carlo Bianconi, after 1815, serviced the cross routes of three provinces, including Connaught, with his fleet of long-cars and jaunting-cars. English, and indeed French and German travellers flocked to Ireland in the post-Union decades, the legacy of which is a plethora of traveller’s accounts and many of the more literate among them published on their return. It is unfortunate from our present point of view that few of these travellers, who mainly concentrated on the well-traversed areas of the South-West, Connemara, Western Mayo, and Northern Antrim, visited Ballinrobe and fewer still have recorded their impressions of the town. Many of these travellers sketched the places they visited; yet, and this is indicative of Ballinrobe's lack of appeal for them, no depiction of Ballinrobe that I know of pre-dates a photograph of 1858 and even that is a picture of the arch in the Dominican church. This is explainable, not, thankfully, by any obnoxious characteristic of early 19th-century Ballinrobe, but, rather because it lay off the beaten-tracks which were Westport, Castlebar, Tuam, Galway via Hollymount, or Westport, Leenane, Oughterard, Galway, Cong. Even Shrule fared better, the latter being depicted in an issue of the "Dublin Penny Journal" in 1834. 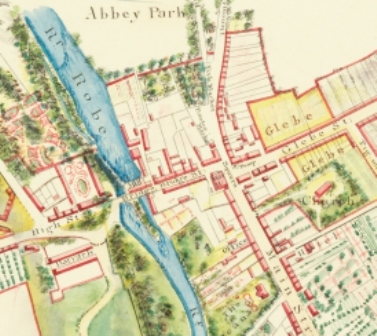 Not to be hamstrung before we begin, it is assuring to know that, as I have indicated, there is still plenty to enable us to describe Ballinrobe, albeit rather sketchily and it, is well to commence by considering the general social climate in Ireland during the fifty years which are our concern. The picture conjured up after an enquiry into social life in Pre-Famine Ireland is not a happy one. The various strata of society in rural Ireland may be judged on the strength of the hold which each class had on the land. Four out of five farmers held less than fifteen acres of land; almost half held less than five acres. The farmer lived a miserable life, being frequently compelled to sell the product of his land, barring an acre of potato ground which he retained for himself, to pay his rent, and/or to pay his tithe, the latter being the source of a bitter social war in the I 830s', the former being frequently the reason for his participating in the notorious activities conducted in places by armed and secret peasant societies like the White Boys, especially near the beginning of the century. Below the farmer in the social stratification came the agricultural labourer, who had a plot of ground attached to his cabin in which he grew potatoes which were almost the sole diet of his generally large family while his rent was paid by his own labour. He frequently kept a pig, which in the Ireland of which we speak, the Ireland of O'Connell, was rather a sign of comparative wealth rather than of poverty, to help supplement his income to meet the rent which he was forced to pay. At the bottom of the scale was the labourer who had no land and who apart from working and dodging the ever proximate starvation tried to live by taking land in conacre. Pay was bad, work seasonal, dwelling conditions deplorable, clothes scanty, shoes virtually non-existent especially as far as women, who were generally spared the rigiours of wielding heavy farm implements, were concerned. Potatoes were the food of the bulk of the people, and even those were of an inferior quality potato, the soggy, soapy lumper. The three main meals of the early 19th-century Irishman's day were all of potatoes, meat being generally a luxury reserved for Christmas and Easter. In the summer when potatoes weren't yet ripe and when the old crop had run out, the poorer people sometimes resorted to nettles and a weed called "praiseach". The townspeople fared somewhat better and were fortunate in that they were not entirely directly dependent on the land; nevertheless the poorer people of the towns were reduced to beggary at certain times of the year, beggars being typical of the Pre-Famine town according to the hoards of accounts by the travellers who were entreated for alms by them. Even the numbers of beggars in the towns were swelled during the summer months by the influx of starving country-folk in search of food and charity, when the potato ran out, This, then, is the general context and the spectrum of experience of Irish life in the half century before the Famine and into which we try to fit Ballinrobe and the countryside around it. This page was added by Averil Staunton on 17/06/2013.